On Omnibuskocher this picture and the company history of Kohler and Lutz, a bus company reports an interesting story. 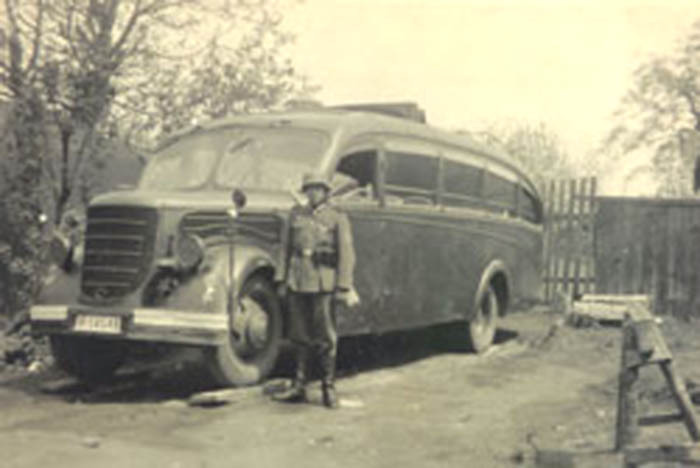 A translated extract: Late 1939 Wilhelm Lutz is drafted for the Wehrmacht with his brand new bus. Erich Fauser stayed behind with the other one and operated the bus line "Metzingen - Reutlingen" and transported workers to Neckartenzlingen. This bus was shot up by a raiding airplane en route from Schlaitdorf to Neckartenzlingen in September 1944 killing Erich. Transportation with the bus went on. Wilhelm Lutz came back after being a prisoner of war in August 1945 without his bus. War mostly affects the man in the street. Litteraly in this story. The pioneering bus drivers managed to revive their company that still exists today.